Be prepared to say WOW! 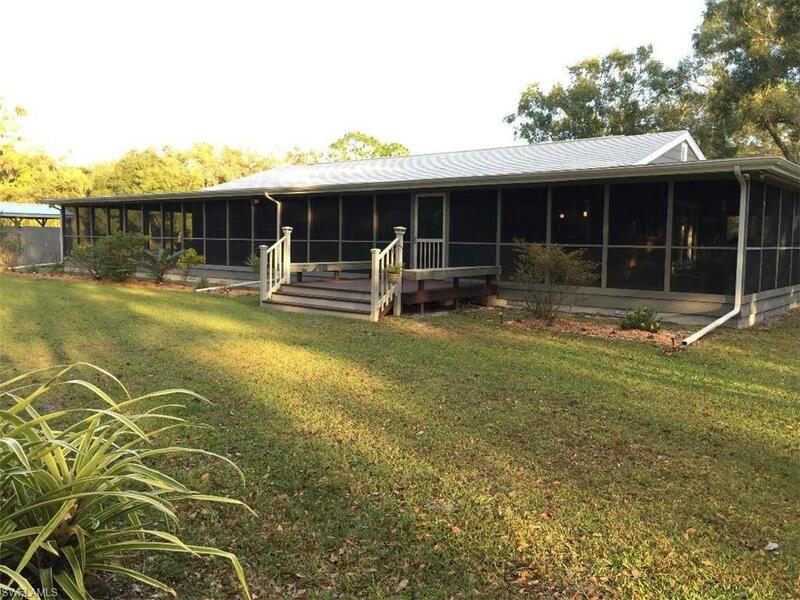 Not only is this country home fairly secluded on 5 acres, and an easy commute to Fort Myers or LaBelle! The wrap-around, secure screened and covered porch will impress you and your guests; the beautiful Bellawood Brazillian Chestnut floors give this home an elegant ambience; the designer kitchen with granite countertops, pantry with roll out shelving, and stainless steel appliances are what most dream of; the spacious master suite opens to the porch through French doors; utility/laundry room opens to the porch as well and is equipped with a washer and dryer, and many more other fine features. The great room design is GREAT! Formal dining area off the kitchen, center island with range and cooktop can be your center for entertaining or a place to enjoy family meal preparation! Majestic live oak trees lend more to the beauty of this 4 bedroom, 2 bath home. Horses are allowed. Outbuildings can be used for garden tools or storage. NEW roofing in 2017. Inside or out, you're going to say WOW! Copyright 2019 Multiple Listing Service of Greater Fort Myers and the Beach, Inc.; All rights reserved. The data relating to real estate for sale on this web site is the copyrighted and proprietary database of the Multiple Listing Service of Greater Fort Myers and the Beach, Inc. The properties displayed may not be all of the properties in the MLS\' database, or all of the properties listed with Brokers participating in the cooperative data exchange program. Properties listed by Brokers other than Riverside Real Estate are marked with BR logo and include the name of the listing Brokers. Information provided is thought to be reliable but is not guaranteed to be accurate; buyers are advised to verify facts before making the decision to purchase a property. No warranties, expressed or implied, are provided for the data herein, or for their use or interpretation by the user. Information provided is for consumer\'s personal, non-commercial use and may not be used for any purpose other than to identify prospective properties consumers may be interested in purchasing. This site will be monitored for \'scraping\' and any use of search facilities of data on the site other than by a consumer looking to purchase real estate, is prohibited. Listing broker has attempted to offer accurate data, but buyers are advised to confirm all items. Information last updated on 2019-04-25.